And Angie saw him. He was standing on the porch of the bar, leaning a shoulder against a post. He was most definitely watching her. When their eyes met he did that smile thing again––half his mouth lifted. When Patrick loses his best friend in combat, he takes a medical leave and heads to Virgin River to get himself together and make some decisions about his future. Angie has lived her entire life pleasing her mother, but a serious car accident has left her questioning her goals. Unable to decide if she wants to continue at med-school she escapes to Virgin River to collect her thoughts. When she meets Megan, a young girl with an ugly scar across her face, she decides to step in and make a difference. She makes it her mission to raise the money that will restore little Megan’s face. Patrick and Angie are both being pulled in different directions. In a few short weeks they will be forced apart, but until then they are able to find a measure of comfort in each other’s arms. Before long they have fallen in love but with Patrick’s commitment to Navy and the widow of his friend, there doesn’t seem to be any room for Angie in his life. 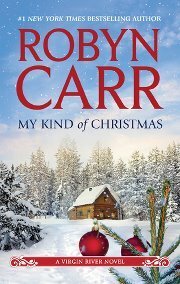 My Kind of Christmas is very much what we have come to expect from Robyn Carr. It’s a light and fluffy love story with an upbeat and optimistic message. A fun book to read over Christmas. Many thanks to Harlequin and Netgalley for providing me with this ARC. This entry was posted in Uncategorized and tagged contemporary romance, My Kind of Christmas, Robyn Carr, romance, virgin river by setaian. Bookmark the permalink.